By all accounts, 2012 was an unusual year for fishing. For me, it was absolutely strange at times. 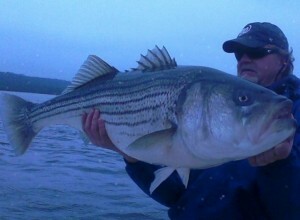 I jigged up my biggest striper of the year on the first day of the year, a 49-incher that might have pushed 50-pounds. It was the only fish I caught. A few days later I got another 47-incher and another one about that size on the next day. Each time it was only one fish per day. Is one fish worth five hours or more of casting? When they’re that size, I think so! Those were some of my biggest fish of 2012, but I’ve been lucky enough to jig up a few more mid-40s class fish since then including this pretty 45-incher I caught in the snow this week. Warm water discharge (WWD) fishing was good last spring, but we really had to pick our days. Our most successful times were early-morning windy weekdays when it was raining or snowing. The WWD big fish bite is always very specific. 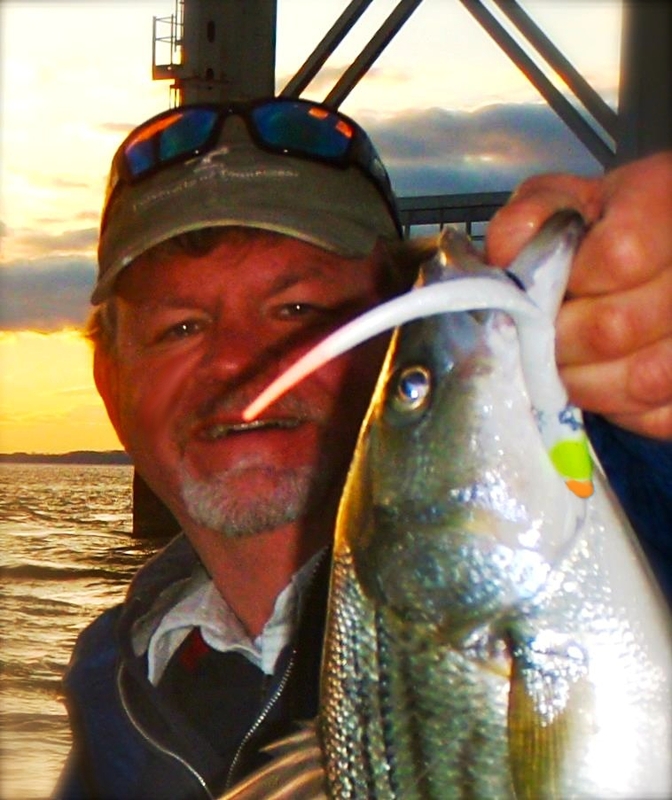 I explain how to get the trophies in my book, Chesapeake Light Tackle, An Introduction to Light Tackle Fishing on the Chesapeake Bay. There are several WWD locations within easy reach of Kent Island. These include locations around the Bay Bridge, in the Patapsco River, the Potomac River, and in the Mid-Chesapeake Region. Any place water is discharged into the Bay in the winter is probably a WWD. These include treated sewage water outflows and discharges by industrial sources and power plants. I didn’t fish the Susquehanna Flats as much this past spring as I have in the past. While there were a few good fishing days in the area, I found flats fishing to be below par this year, especially for big fish. 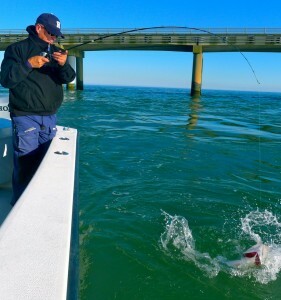 By the time the Flats started heating up, we were already able to catch a few fish in Eastern Bay and around the Bay Bridge, so I didn’t see much point in burning the gas to go up that way. 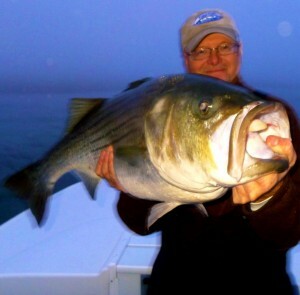 All in all, I found spring fishing on the Chesapeake to be below average in 2012. Summer was a different story. Thanks mostly to low-rainfall, water quality was very good in the Upper Bay this past summer. As a result, resident stripers that usually migrate farther south, stayed in the area. We had very good fishing from the mouth of the Severn River all the way up to the knolls around Tolchester. There were also some fish farther south. Since water quality was better on the west side of the Bay, that’s where most of the bait stayed so also the rockfish. Those fish were mostly suspended, so you just had to plug away at them in order to get them to bite. By late summer we saw a slight pattern change with breaking fish in the areabetween Poplar Island and Sharps Island. This was mostly 16-25 inch-fish, but still fun to catch when they were surface feeding. 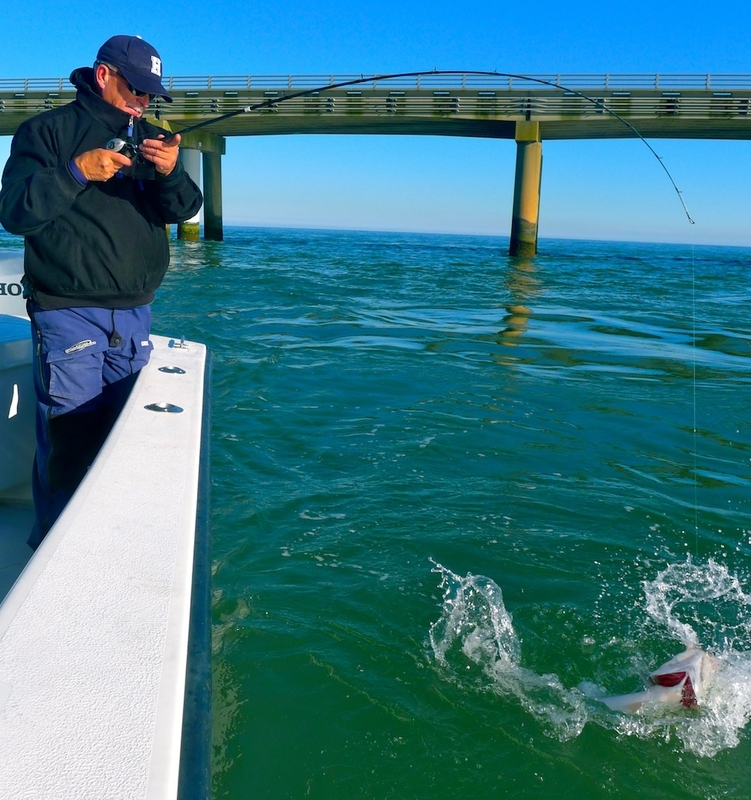 In the mean time, the Upper Bay bite hung in there with most fish set up along ambush points near ridges in live oyster bottoms. 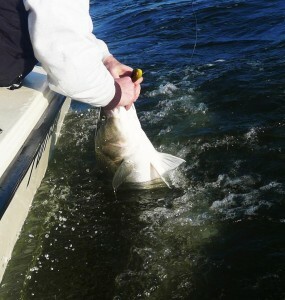 The biggest bright spot in the summer of 2012 was the return of redfish and speckled trout to the Chesapeake Bay. 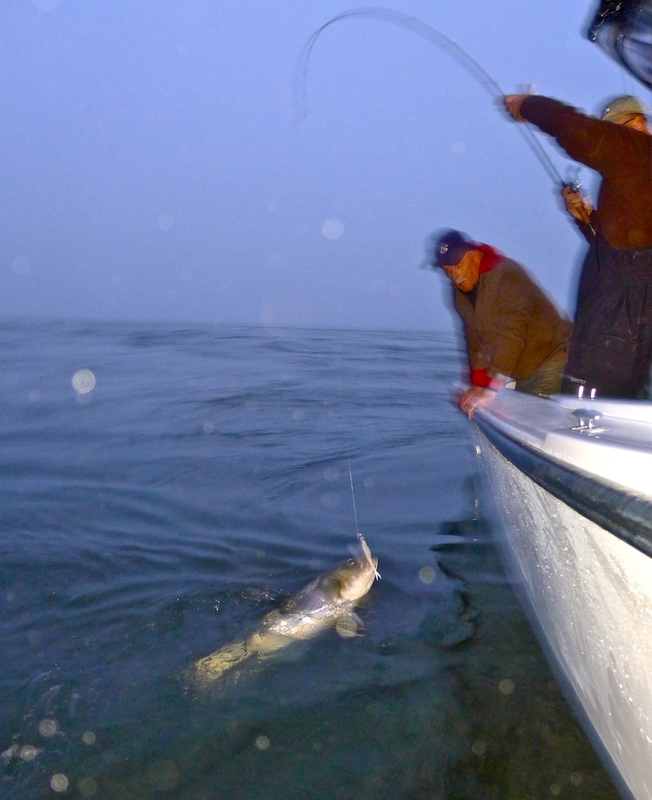 Anglers report puppy drum all the way up in the Susquehanna Flats and speckled trout were caught as far north as Eastern Bay. Fall striper fishing was poor overall, but there were a few bright spots, particularly around the Bay Bridge. Breakers on the east side near the Kent Island Sewer Pipe kept most of us busy but there were also some very nice fish being caught off the pilings. I also did a lot of fishing along the shoreline in Eastern Bay. There were some fish around, but I thought it was slower than years past. 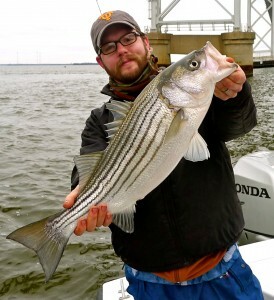 Although there were some nice fish caught south of the Potomac River, the much anticipated migratory schools of late-fall trophy stripers never materialized in the mid and upper-Bay this year. I think that was mostly because Hurricane Sandy blew in warm water along the Atlantic Coast and kept the bigger schools farther north than usual. Since my last entry, I’ve made a few trips to the Chesapeake Bay Bridge Tunnel (CBBT). This has become an every-year-event for my family. Just as in years past, we rented a house in Cape Charles and used this as our base for fishing the bridge or the ocean. Fishing the CBBT and the ocean this December was very tough. While we found a few fish in the ocean north of Chincoteague, I was never able to locate the big schools we saw last fall. I’ve received several reports of big schools here and there, but I don’t believe they’ve been as prevalent as years past. Now, it’s winter again and I’m back in the pattern of fishing the WWDs and the Bay Bridge rock piles. There are fish to be caught if you’re brave enough to stand the elements this winter. I may even make another trip or two to the CBBT. All the pictures in this report are from the past three weeks. Before long, I hope to get in some perch and pickerel fishing in the rivers. In summary, it was a bad spring, a relatively good summer, and a bad fall. The winter pattern so far is about the same as last year. Not just based on this year, but in observing past patterns, I can’t help but think our striped bass are in decline. I’ve fished the Chesapeake Bay for six years now, and I’ve definitely noticed a change in fishing for the worse. While we’re still seeing some nice fish in the 40-inch-plus class, and there are zillions of young fish, what’s missing is the mid-20s to mid-30 inch fish. That’s the class of fish that is most important to recreational anglers. I’m hoping to work harder than ever with other fishermen along with CCA Maryland in 2013 toward getting the decision makers at the ASMFC and at Maryland DNR to realize we have a problem with striped bass and they simply MUST take action to make changes. We HAVE to protect the big breeding fish so they can reproduce. Spawning stocks are way down and still declining. Let the cows go. They don’t taste as good, and they’re full of mercury. Why take the risk of poisoning your family and diminishing the species? Catch ’em, get a picture, and turn ’em lose. By the same token, recreational fishermen need to let the little fish grow. I cringe regularly when I read the Internet mailing lists and see fishermen and sometimes even guides bragging about catching upwards of a hundred baby fish. The chances of catching a big striper our of a school of dink rockfish is ZERO. If you keep trying, you’re just going to kill more fish. Let’s leave those baby rockfish alone. 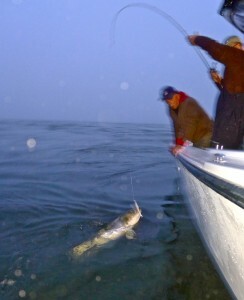 Here’s to flat seas and tight lines in 2013. Cheers from Chesapeake Light Tackle! Shawn, it may not have been a “up to standards” year but it sure was a good time..I’m in total agreement with you in reference to the stocks being down..this was the first year in a while that my notes..(notes targeting certain areas that hold fish in certain water temps) didn’t help me much.. The pattern really changed this year..though we had some really good days,I had quite a few bad days..and there are definitely alot of small fish around.. Looking forward to this year!.. I wish you and the Koch brothers a wonderful 2013, may the big fish bite often. I will miss Super dink! RIP! Thanks for taking the time for this excellent review of 2112. Great review thanks for all the time you spend sharing your knowledge to make us better. Happy New Year!!!!!!!!! As a thought, I wonder if redefining the trophy season bag limit to allow the one fish to be below 28″, say between 22″ and 28″, perhaps in conjunction with an upper size limit to protect the big cows, might be a way to take pressure off of the larger fish while still providing more or less equivalent fishing opportunity. Also, for information of your readers with the Navionics Android app, I’ve been annotating the commuity layer (fishhawksnest entries) with upper tidal Potomac information that is available from various publicly available information for rocks, ruins and wrecks, and also for structures that are not shown in the chart layer which otherwise leaves the impression of unobstructed water. I’ve also annotated the community layer with the location of artificial reef structures (rubble, pipes, Reef Balls, etc) within the Maryland Chesapeake Bay artificial reef/fish haven sites insofar as my personal recollections and reef data (from my days at MES managing the reef program) are available. Most positions are close approximations except where I have sidescan data from my Humminbird 798 or I was able to pinpoint using BING and Google aerial and birds eye view pictures (some of the low water pics are very revealing). I also annotated charted wreck and obstruction data using NOAA’s AWOIS database to describe what is reported to be there. I plan to refine/correct postion location as I obtain additional sidescan/downscan data during my fishing and cruising adventures. I tried side scan Horton’s Hole using your coordinates provided in Navionics but did not see jetty. Have you checked those coordinates and found the coordinates accurate and the jetty’s 60 yards length and 4 feet width correct? The position and details for Horton’s Hole were pulled from a web article. The link is in the community layer note. Nothing discernable from aerials. Treat position as approximate and operate with caution as the area is shallow and there are various rocks and obstructions. I’m spending most of my fishing windows on the Bay, but plan to hit a number of sites in the river with my electronics as time permits. I update my Navionics community layer postings from field observations as new info developed. Those are pretty fish and thank you for the report and annual summary Mr. Kimbro. Now, at least I know where we should have been fishing. Well said Shawn. Definately a different year. The diversity kept me sane when med/large rock were somewhere I wasn’t. Blues, Croaker and Perch were awesome this year. Happy New Year to you and yours. I see at least two high stick penalties. Just one, Rich just has his index finger on the blank. The rod held up both times. Wish I could find more like that! Wayne, thats great stuff you’re doing there on the Potomac. I’ll be watching to see how it goes. Shawn: It’s always a pleasure reading your reports. You are kind enough to share your trips and knowledge of how to catch fish. This helps anglers learn to catch more fish.